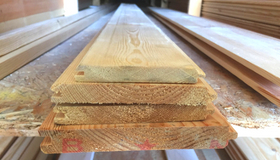 Timber is being increasingly specified as the material of choice for cladding, both interior and exterior. Cladding can enhance the external look of any building, making it far more interesting and often more pleasing to the eye. 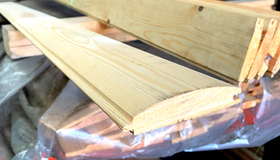 Timbers versatility means cladding can be produced to virtually any requirement. Cladding can be machined from Hardwood and some Softwoods, such as Western Red Cedar, Larch and Douglas Fir which have a natural resistance to decay. 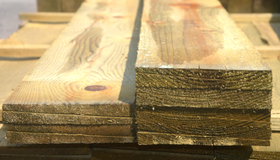 Any less durable timber can be treated to prolong its life in service. T&G Cladding is used for a wide range of external & internal applications such as sheds, garages, cabins, walls, panelling and many more. Boards have been machined to form a tongue & groove fixing with V joint that gives a pleasing look to the whole structure. 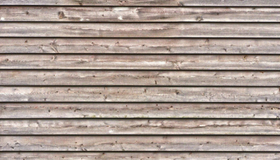 A popular timber cladding for the exterior of home office cabins, garden sheds and garden rooms. It retains the attractiveness that a square board gives whilst giving a strong rustic feel. A traditional means of cladding a building and also known as weatherboarding or featheredge boarding. 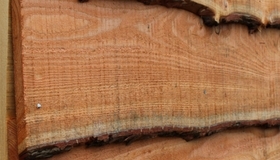 A very traditional style of cladding which is created by overlapping boards that have been sliced straight from the tree. Each board has one waney edge (with bark on) and one square edge. Larch, Homegrown Douglas Fir and Cedar. To order only, contact your local branch for more information.